CloudFuze goes mobile with its new Android release, taking the first step toward serving today’s BYOD workforce. 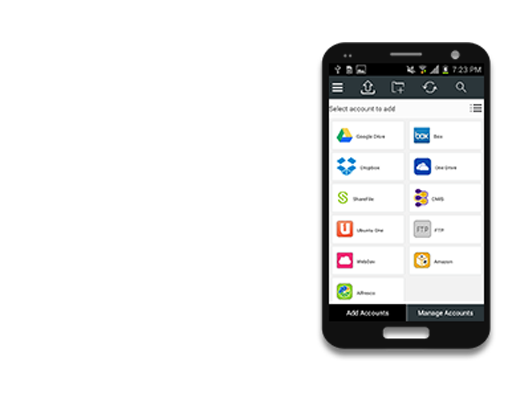 CARY, NC – May 14, 2013 – CloudFuze, a leader in cloud storage services management, has announced the release of an Android app to complement its flagship desktop application. The new product brings all of CloudFuze’s capabilities to Android mobile devices, moving closer to CloudFuze’s ultimate goal of providing “any device” support for cloud storage services users around the globe. Ravi Poli, CloudFuze Founder and CEO, recognized a growing need for more effective cloud storage services management for modern mobile workforces. By bringing its cloud storage aggregation and management platform to Android users, CloudFuze has begun to meet this need. As the company’s first product for mobile devices, the Android release also supports CloudFuze’s ultimate vision for a collaborative workforce that leverages mobile technology and cloud services to better enable and empower workers. The CloudFuze Android app is just a part of a complete suite of products that will soon include iOS and web applications, both expected to be released before the end of 2013.